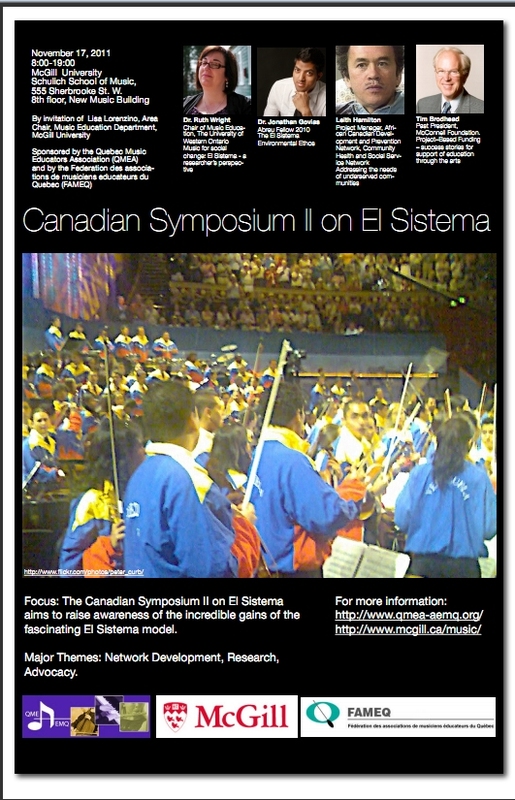 Hot on the heels of the first Canadian Symposium on el Sistema in May at the University of Western Ontario comes the pragmatically named sequel The Canadian Symposium II on El Sistema at McGill University, Montréal on Thursday November 17th. I’m assuming my presentation back in May at UWO wasn’t terrible, because I am delighted and honoured to have been invited to speak again on the advertised topic of The El Sistema Environmental Ethos. The alliterative name for the presentation comes from my recently published article on the Five Fundamentals in which I proposed some elements of the Sistema philosophy that in practice can have a significant effect on the classroom culture. This is something worth investigating: instructors within La Red in Venezuela rarely if ever have the same kind of formal training of music educators in North America, yet Sistema remains a model high-functioning music education network. Why? and How? as questions are always more much more interesting than What?, and I’m looking forward to addressing those aspects in Montréal on the 17th of November. I’m not going to give away any more spoilers, so please plan to attend. You can find the registration form here and the conference poster here, both as direct downloads in PDF format, or via the QMEA link at the top of this page. My sincere thanks to Theodora Stathopoulous, ISME Board member, and Lisa Lorenzino, Head of Music Education at McGill, for the invitation to participate. As a postscript, the YOLA program of the LA Phil has also announced a Symposium January 30 through February 1st 2012, with the intention of convening núcleo leaders from across the country for discussions and networking. LA Phil should be commended for taking the initiative in this area while El Sistema USA gets back on its feet. I’ll post more information when it becomes available. ← “Five Fundamentals of El Sistema” now available online and in print – en francais aussi!